Stay informed with our FREE Currency Emails. Get daily analysis of currency markets, exchange rates, and news delivered straight to your inbox. XE offers two different daily emails for your personal use to keep you up-to-date on what’s happening in foreign exchange markets. 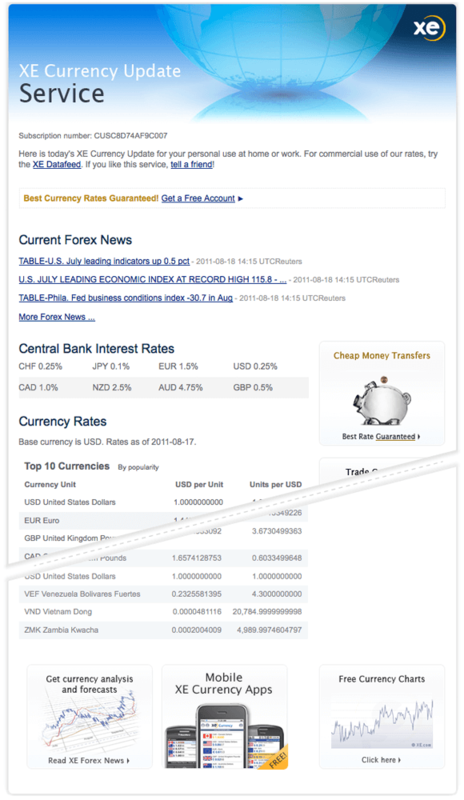 To obtain currency rates for your business, check XE Currency Data for Business to learn more. Get daily exchange rates for top currencies in relation to your base currency. Analysis of where the currency market is, where it's going, and why it's going there. Need currency rates for your business? Get accurate and reliable rates with XE.